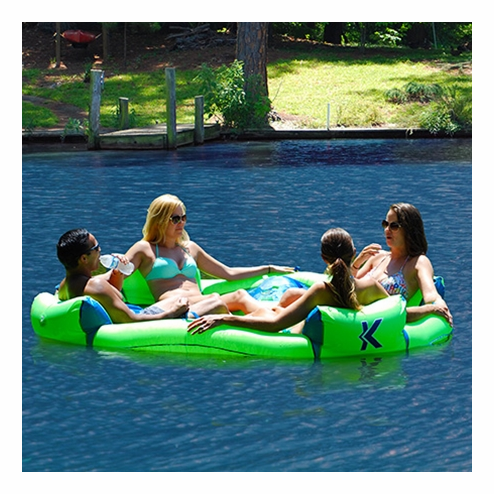 The Kelsyus Big Nauti is an over-sized 4-person party float perfect for chilling with friends at the lake, pool, or river! 4 spacious seating areas with backrests, soft mesh seats, footrests and two cup holders for each person. The circular design is great for conversing with friends as you float along enjoying a perfect day on the water. The mesh seats suspend each person's lower body just below the surface of the water, keeping everyone cool. Durable 12 gauge inflation chambers and D-ring for tethering to other floats, boat or dock. Four handles for easy carrying. Quick-release valves for faster inflation/deflation. Dimensions: 7.6 ft (2.3 m) diameter x 1.3 ft (0.4 m) height.